Cascadian Farm introduced two new granolas at the same time, this one and a dark chocolate almond variety. This one is the better of the two. 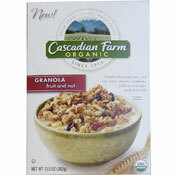 Cascadian Farm Fruit And Nut Granola is okay. It has a general natural flavor, nothing amazing. It's not too sweet, despite sugar being the second ingredient listed on the side. There's subtle tones of vanilla that I enjoyed. The problem I had with this cereal is that nothing stands out. It has raisins, dried cherries and cranberries, sunflower and pumpkin seed, and almonds. That's a lot of great sounding stuff, but they all sort of combine to result in an almost boring fruit and nut flavor. My favorite bite of this cereal was one that happened to have more sunflower seeds than others. It's not that I'm totally gung-ho for sunflower seeds. That particular spoonful was distinct, a break from the hodge-podge of combined flavors. 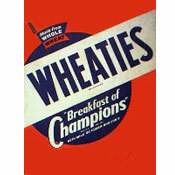 I'd love to see this cereal slightly reworked. If they had enough confidence in any one of the many flavors to feature it more than the others, this could be a really nice cereal. For now, it's a little bit dull. What do you think of Fruit And Nut Granola?